The 39.6 metre motor yacht Inclination II has been sold, report her listing agents for sale, Burgess. Designed by Roberto Del Re, Inclination II was built in GRP by Italian yard FIPA Italiana to RINA class and delivered in 2008 as the fifth in the yard’s Maiora DP39 range. Accommodation is for up to 12 guests in five cabins consisting of a master suite, two doubles and two twins, all with full en suite facilities. A large sundeck has expansive spaces for sun beds and a bar, al fresco dining area and a pop up television screen. Another popular area is the main saloon which is decorated in light colours and boasts a 50 inch home theatre television system that can be lowered into the bar separating the saloon and formal dining area, which seats 10 guests. 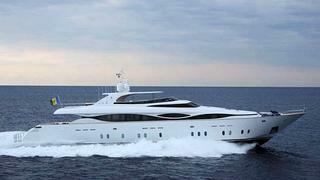 Twin 3,650hp MTU engines and a planing hull give her a top speed of 30 knots.